PONTE VEDRA BEACH, Fla. – Just a few weeks ago, three FAMU students were afforded the unique opportunity of a lifetime. They were special invitees to cover one of the media days and practice rounds at The Players at TPC at Sawgrass. Widely regarded as the “fifth major” on the PGA Tour, The Players annually has one of the best fields in golf. This year was no different as top golfers Rory McIllroy, Jordan Spieth, Jason Day and Ricky Fowler were in the field. 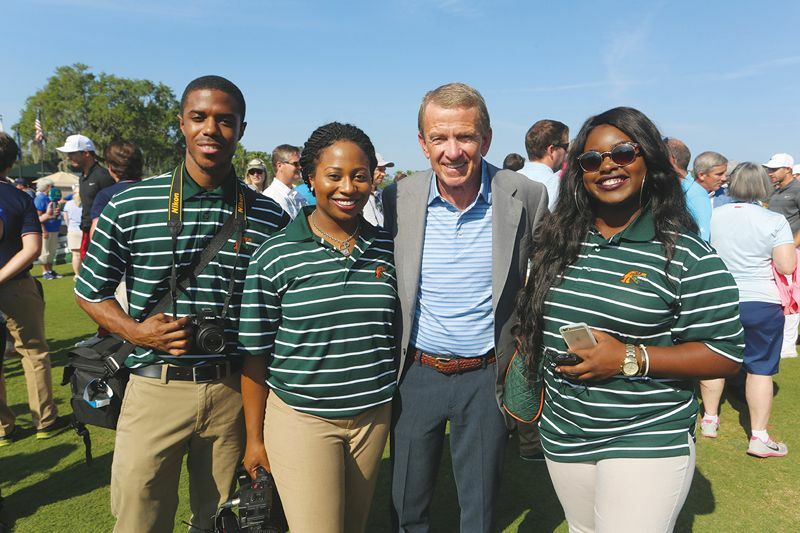 The FAMU students were rewarded with the opportunity by PGA Tour Media Relations on a special invite afforded to FAMU Athletics. All three students were interns in FAMU Athletics for the 2015-16 school year and were rewarded for their professionalism and drive during the year. FAMU Sports Information Director Vaughn Wilson escorted the students to the tournament. Wilson covered the PGA Tour for nine years as the sports editor of the Capital Outlook Newspaper and his work was published in black newspapers in Florida and across the nation via the National Newspaper Publishers Association (NNPA). The students were Morgan Culler (senior business/journalism student), Amber Jones (senior journalism student), and Jeff Weddington (graphic design graduate, spring 2016). FAMU Athletic Director Milton Overton was supportive of the intern initiative. The day began with a tour of what is considered one of the most technologically advanced media facilities in the world. After the tour of the media center, the interns were escorted to the “First Timers” press conference. That press conference was for players who were playing in the tournament for the first time. The interns researched the players in advance and had selected Tallahassee resident Hudson Swafford as one of their interview targets. Swafford noticed the Rattler icon on the polo shirts of the interns and flashed a smile as he recognized that the students were hometown media. Swafford was the first of several interviews the interns had the opportunity to do with current PGA golfers. As the students made their rounds, they ran into Harold Varner III. While talking to Varner, the unimaginable happened. PGA Tour Commissioner Tim Finchem, who was making his rounds presenting each new player with a pair of Tiffany cufflinks, was intrigued by the only three media persons dressed in uniform. Once he was informed that the media crew was in fact the students from FAMU, Finchem took out time to chat with and encourage the students. For a few moments, because of the way they carried themselves, the opportunity that journalism students across the country would give anything for was right before them, a conversation with one of the most powerful men in all of professional sports. To top things off, Finchem posed for photos with the students. Nearing the end of the trip, Wilson suggested that no trip to TPC Sawgrass was complete without a visit to the most famous hole in golf – the Island Green at No. 17. Marveling at the beauty of the stadium course, the students were not only intrigued at the players and caddies playing the hole, but also the technology the PGA Tour had dedicated to each area. There was a free high-speed wireless network on the whole course, cell phone repeater towers, multiple video boards, wireless camera receivers and on the 17th hole, a remote camera similar to the ones used in the NFL to capture the huddle. “I never imagined, watching golf on television, that this much technology was required for what we see. It is as if they make a whole city right there on the golf course,” said Weddington. Suddenly a big crowd drew near. It was a clear indication that one of the stars of the PGA Tour was approaching. Wearing his purple Under Armour polo shirt, Spieth approached to much fanfare. Taking his smooth swing. He landed his shot just a few feet away from the center pin placement on the island green. After signing autographs for some kids from the First Tee of Jacksonville, he was on his way.